I have experienced, many times in my life, families who have had great tensions. Oftentimes, members of the family would not have spoken to one another for a period of years. Yet, if a member of the family were assailed by someone outside the family, the entire family would draw together to protect their own. There seems to be something almost magical about the way families are bonded. The “family of man” seems to be the same way as well. We are all quite different and yet, when assailed, can draw together to protect one another. This is often seen in times of war or in times of tragedy. Take, for example, the recent hurricanes. Some areas of the south were devastated by hurricanes earlier this year. Different ethnic groups and socioeconomic levels that generally do not mix all of a sudden worked as one to put their lives back together. It seems that tragedy made them realize that all their differences were nothing compared to what makes us all one. There are geneticists who are saying the same thing. They are looking at human DNA and are making statements that they can actually trace all of humanity to one set of parents. So many people have said that the story of Adam and Eve was just that, a story. But there are scientists who are trying to prove that all of our roots can be traced back to one couple. 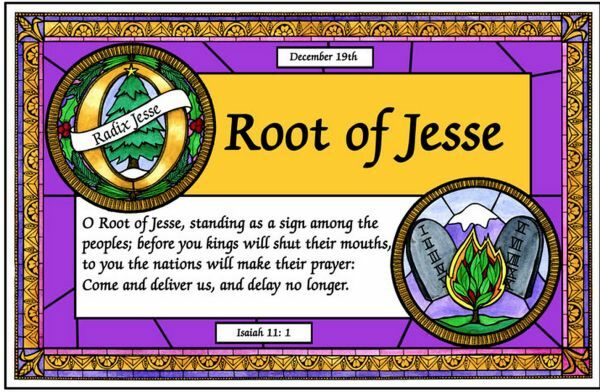 Today’s “O Antiphon” — “O Root of Jesse” — reminds us that we, indeed, can trace our lineage back to one source. We can go back further than Adam and Eve because they were created as well. We trace our roots back to God. The Root of Jesse reminds us that we are all one family. As such, we should treat each other with the respect that is our due. Yes, there may be squabbles that come about and affect our family. Yes, we might not always get along with one another. Yes, we may often divide ourselves because of many issues. However, when we put it all together, we are one. FAITH ACTION: Pray for all the members of your family, especially any members who may be estranged from the family for one reason or another.